I recently had a list of future blog topics stored in Evernote that suddenly became more complicated due to some synchronisation issues (one list became one list with three sections). I’ve also had people at work ask about de-duplicating a list of contacts with email addresses and also a list of links for a site (backlinks). 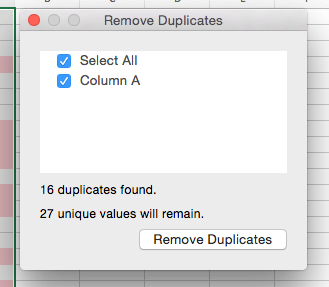 It seems that I quite often forget about one of the best list de-duplication tools around – Excel. If you have a list of items that contains duplicates, then there is an under-appreciated feature in Excel that can help you out easily and quickly. 1. 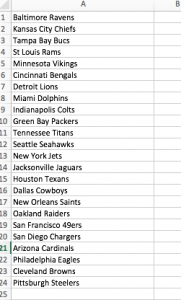 Either import or copy and paste your orginal list (containing duplicates into a new Excel workbook). 2. Highlight the data rows (if you have more than one column then select all of it of course) and then select the Data menu and Remove Duplicates from the ribbon. 3. 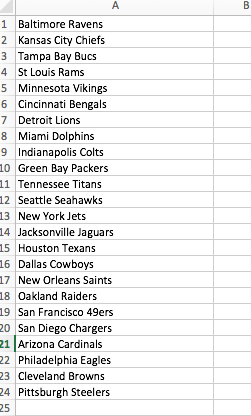 Press “Remove Duplicates” and.. voila (from 40 records down to 24)! I just need to remember this myself rather than always looking for a more complicated option.